The first time I heard Michael Graner read Hebrew I knew I was in for trouble. 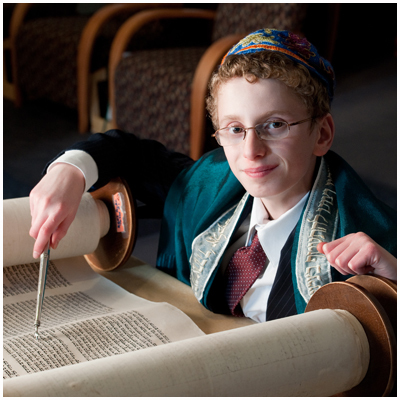 As a congregational rabbi it is my job to make sure that every child is adequately prepared for the bar/bat mitzvah. Bar/Bat Mitzvah tutoring is not the most prestigious or glamorous part of my job. Nevertheless, I pride myself on being sure that every child can read the Torah blessings and Parsha (Torah portion) fluently. When Michael came to my office that fall to have his Hebrew fluency evaluated I had no reason to expect that he would be any different from my other students. I had observed Michael during Mid-week Hebrew over the years and I remembered him as a normal, boisterous twelve year old. “Go ahead and read the Torah blessings,” I said to him. “O.K.,” he said. “Rabku at Edonee…” He stopped and looked up sheepishly. “What?” I said. “Read it again.” It was late in the afternoon and I assumed that fatigue was affecting my hearing. “Rabku at Edonee,” he read once more. I winced at Michael’s mispronunciations and seeming disregard for the Hebrew vowels and even its consonants. We were in deep trouble. Michael had been in Hebrew School for three years and had somehow managed to escape learning any Hebrew. In truth, he seemed to know some Hebrew, but he persisted in confusing one Hebrew consonant for another. It was now October and his Bar Mitzvah service was seven months away. Faced with the almost insurmountable task of teaching Hebrew to Michael in seven months I took a deep breath. “Try it again,” I said to Michael. To add one more wrinkle was the fact that Michael came from an interfaith family who desperately wanted him to have a Bar Mitzvah but who lacked any ability to reinforce Michael’s Hebrew studies at home. “What should we do?” the mother asked me. “”How hard could it be?” I wondered to myself. Two months went by, very slowly. His reading of the Torah blessings was still deeply flawed. Close, as they say, but no cigar. Michael’s Torah and Haftarah portions were in even worse shape. Michael could barely make his way through the first couple of words. How would he ever learn his parsha? How would I ever be able to train him to read directly from the Torah? I honestly did not know how to teach Hebrew to someone who learned differently. Law School was looking better all the time. That October I had lunch with a friend who is an educational consultant. I described my frustration over Michael’s inability to grasp Hebrew. “He’s obviously got Dyslexia or some kind of Language Processing Disorder,” she said. “Put the Torah blessings on YouTube, and let him listen to them over and over. Have him write the Hebrew out phonetically in English. See if that helps jumpstart him. I went home that afternoon thinking about learning disabilities and wondering what else I didn’t know about teaching Hebrew. The weeks went by and I tried new techniques every week. I posted the blessings on line and made Michael listen to them every day. I recorded a sound file of his parsha and downloaded it to his iPod. Michael listened to the sound files every single day, as if they were the newest lectures from Tony Robbins or some other motivational speaker! I taught Michael to recognize syllables, instead of just words. I had Michael whisper the prayers and then I experimented with having him shout them at the top of his voice. I tried at every Hebrew lesson to have faith in Michael. And even on the days that he faltered and failed to recognize any of the Hebrew I tried to just put my faith in, well, You-Know-Who..
A month later when he learned to sing the Torah Trope Michael’s face brightened. My educational consultant had suggested that this might happen. Some kids with learning disabilities do better when they sing, than when they read. He then again repeated the Torah blessing fluently and without a mistake. Just like that. One week he couldn’t do it and then the next week he did it flawlessly. Michael had gone from not knowing it to getting it. I couldn’t credit my inspired teaching or even the advice from the consultant I had used. It was almost as if a miracle had happened. “How did you finally learn it?” I asked Michael. “I just practiced like you told me,” he replied. And then Michael looked down and began to chant the “V’ahavta”. A few months after that Michael came to the bima and chanted the entire service effortlessly. He then chanted his aliyot, without a mistake. Only a few people in the room could truly know what a triumph that moment must have felt like for Michael. Of course Michael’s Jewish grandparents were moved by the bar mitzvah of their grandson. But even Michael’s Methodist grandparents were touched by the importance of Jewish values their daughter had helped give their grandson. I learned many lessons from tutoring Michael that year. Learning disabled kids are just like other kids. They need help and they need love. And interfaith families are the same as all Jewish families. They need to know that their rabbi will support them in what can be the difficult task of raising Jewish children when one parent isn’t Jewish. As Michael was chanting his haftarah I caught a glimpse of his parents, their faces bathed in pride. I looked away, my own eyes starting to mist. We were watching a young boy begin the long odyssey from ignorance to literacy, from confusion to commitment. Watching Michael that day I marveled at the strength that God gives us to overcome whatever flaws or deficits we may have. Having conquered his inability to read Hebrew, Michael was now over the hump. The legal profession was safe from me, at least for the time being. The rabbinate had suddenly become fulfilling again.